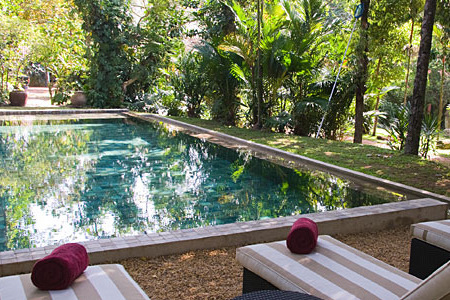 Set in expansive gardens it's hard to believe that The Wallawwa is just 20 mins from Bandaranaike International Airport. 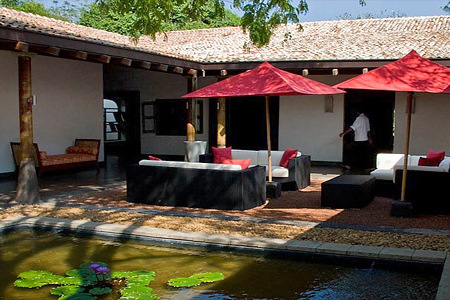 The Wallawwa, meaning manor house or aristocratic home is a tranquil oasis of calm for those recovering from a long flight, about to return home or in transit around the island. 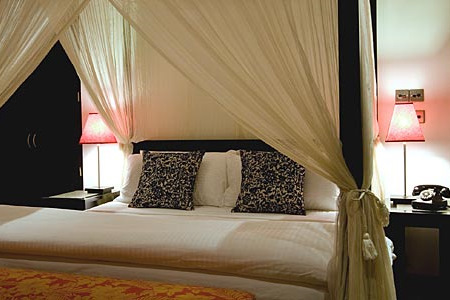 This boutique hotel has 17 rooms - 12 of which are described as Garden Suites, 2 Wallawwa Bedrooms and 2 Family Suites. A recent addition is the brand new Mountbatten Suite. The Garden Suites are rather impressive, with huge terrazzo en-suite bathrooms/wet-rooms sufficient in size to drench a small football team! They also have Wifi access, flat screen satellite TV's, dangerously comfortable beds given that the flight won't wait for you, private verandahs and a funky red batman style telephone which can put you through to the staff 24 hours a day. The management and staff are particularly good on this point, happy to greet or bid farewell to guests at any hour of the day or night. The Wallawwa rooms are also lovely, but a significantly pared down version of the Garden Suites,the WiFi access, satellite facilities and superhero phone remain the same. 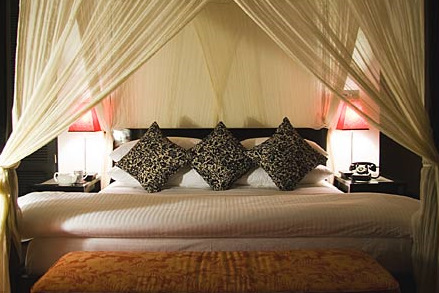 The Family Rooms are spacious with one king size four poster bed and two large single four poster beds. The en-suite wet room has a rain-shower, basin & WC. 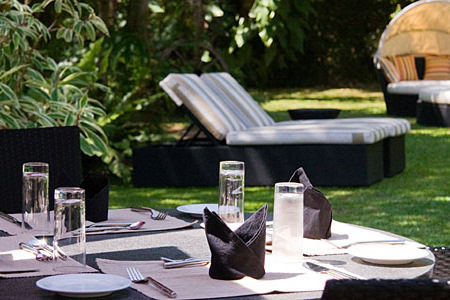 There is a private verandah which has a comfortable built-in seating area. Meanwhile, the new Mountbatten suite is double the size of the Garden Suite - a huge 150 square meters - this suite has a large living room, an expansive bathroom with rain-shower and terrazzo bath, and a private garden with plunge pool, as well as an additional twin bedroom for children or to use as a TV room. 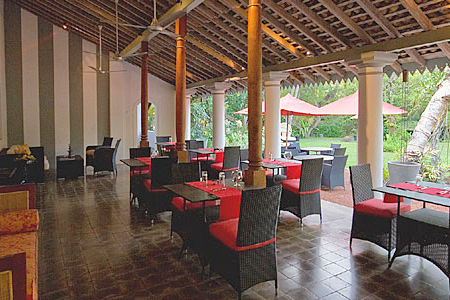 Wallawwa's recently-opened restaurant The Verandah overlooks the lush gardens and has a bar where guests can unwind and relax throughout the day and evening. 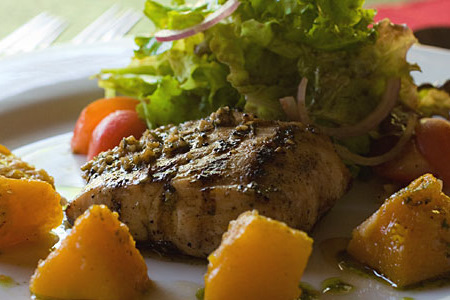 The sophisticated menu is probably best described as Asian fusion and offers elegant, well presented dishes. The orange leaf and lemongrass panacotta that finished our meal was especially good. The Wallawwa's current head chef is Sri Lankan born but spent a considerable amount of time in the States recently returning from the MGM in Vegas. 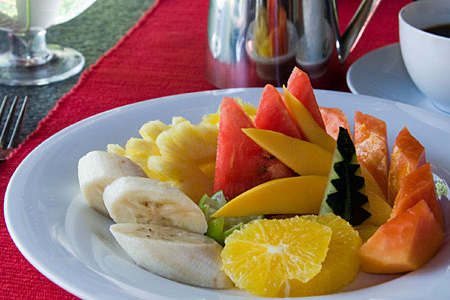 As The Wallawwa was designed predominantly as an arrivals and departure hotel there is not too much to do in the local area, however, Colombo is not far away nor are the beaches of Negombo (20 mins). The hotel also has a fabulous Spa which can be enjoyed by residents at any point during their stay - there is even a special massage for children aged two to 17 years-old that aims to calm the nervous system and encourage children to focus on their activities! 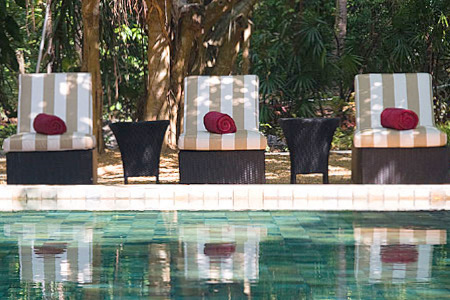 Guests can also swim and sunbathe at the hotel's charming pool, positioned in a quiet corner of The Wallawwa's garden. Alternatively, the Library is available for downtime, and complimentary Wifi is available throughout the property and guests can also use the iMac free of charge in the study. Editor's Note: The Wallawwa have since change their menu pricing to include government tax. Only a 10% servIce charge is now added to the bill.